There has been a demand for a quality horror movie in recent years, following the successes of genre affair such as It Follows, Lights Out and Don't Breathe. Even though horror movies often do well financially, they don't often land with critics. Even those previously mentioned movies weren't immune to their fair share of critics who simply disagreed with the general consensus. But that is what makes Jordan Peele's horror movie Get Out a truly big deal, because the movie miraculously still holds a perfect 100 percent on Rotten Tomatoes. As of this writing, with 135 reviews counted, the hit horror flick still boasts an unblemished, 100 percent approval rating from critics on Rotten Tomatoes. That isn't just unreasonably impressive for a horror movie, it is borderline impossible for any movie to achieve. Plenty of movies hold perfect scores on Rotten Tomatoes, but they are often classics such as Citizen Kane, or well-liked, smaller movies that simply don't have that many reviews factored in. Only a very small, select few movies have ever had more than 100 reviews counted and still managed to boast a perfect 100. As of right now, Toy Story 2 (163 reviews) and the documentary Man on Wire (154 reviews) are the only other movies to ever do so. There are a lot of reasons Get Out accomplishing such acclaim stand out. For one, as mentioned, it is a horror movie and that rarely happens within the genre. Not only that, but this is Jordan Peele's directorial debut, who, prior to this, was a man known mostly in the world of comedy thanks to his sketch show Key & Peele. 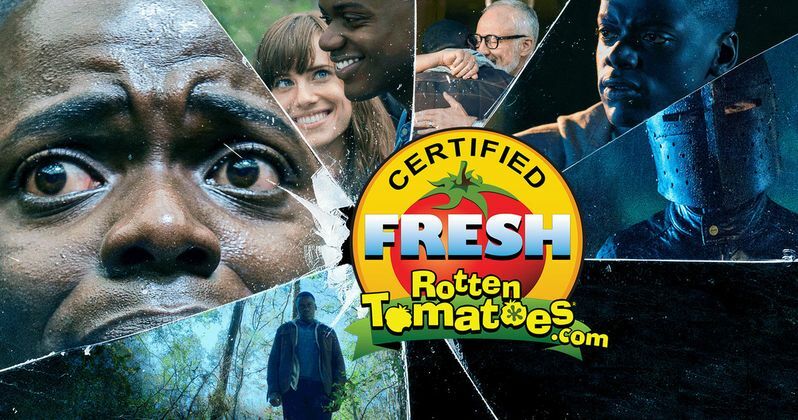 While there are some laughs in Get Out, the movie is absolutely a horror movie through and through, so it is pretty amazing that with a first-time director who is mostly known for comedy, a horror movie about race has managed to breakthrough in such a big way. In Get Out Chris (Daniel Kaluuya) and his girlfriend, Rose (Allison Williams), have reached the meet-the-parents point in their relationship, so she invites him for a weekend getaway upstate with her mother Missy (Catherine Keener) and her father Dean (Bradley Whitford). At first, Chris reads the family's overly accommodating and strange behavior as nervous attempts to deal with their daughter's interracial relationship. But as the weekend progresses, a series of increasingly disturbing discoveries and happenings lead him to a truth that he could never have imagined. It is not only possible but likely that at some point a negative review will pop up and challenge that perfect Rotten Tomatoes score, but it ultimately won't matter. Get Out is also going to be able to add financially successful to its list of accomplishments, because it already made $30.5 million in its opening weekend at the box office, which was good enough to dethrone The LEGO Batman Movie. That will wind up being much more important in the long run than a single bad review. With a reported budget of just $4.5 million, that will likely make Universal very happy and should ensure that we get some more directorial efforts from Jordan Peele in the future.